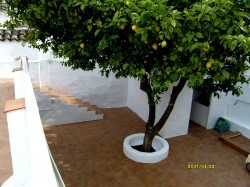 Great new property for sale in Jimena de la Frontera. 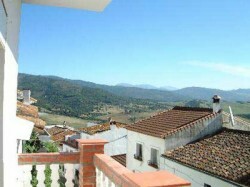 This new listing is ideal for all you lovers of the typical white washed villages of Andalucia Spain. Jimena de la frontera is probably the most quaint and attractive of them all. Located along the road from Ronda to Algeciras, Jimena can be reached by car and by train. 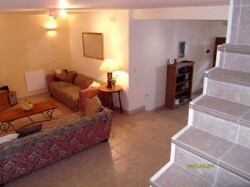 JIMENA DE LA FRONTERA Village property for sale. This is a delightful 3 bedroomed town house at the top of the historic white village of Jimena de la frontera near to the Castle of Jimena. The house has been modernised to a very high standard throughout with a spacious and light interior. The colours are neutral colours and the house has a fresh feel. If you want to buy a property in Jimena de la Frontera and you want to move in straight away- then this is your property. Jimena de la Frontera: Property details. Ground floor has limestone floor tiles throughout and the walls have been dry-lined to give a European style smooth finish to the walls. (this is great to keep the damp out and the heat in). The sitting room is spacious open plan and leads onto a fully fitted kitchen with oak units and granite work surfaces. Here you will find all the modcons, fitted dishwasher, hob and electric oven. 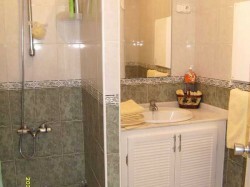 There is a useful rear utility / lobby off which is the family shower room with toilet. This is the only negative point. There is only one toilet / shower room. However there is a possibility to turn one of the upstairs bedrooms into a nice 2nd bathroom. 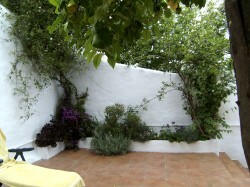 At the rear of this Jimena property is a delightful private courtyard with a large mature lemon tree at the centre. 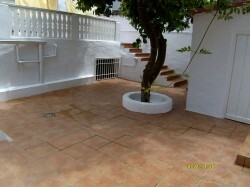 Across this delightful courtyard is a casita (wash-house) with washing machine, sink, tiled work surface and useful storage space. There is a douche type shower in the courtyard and tap for garden hose. There is also drainage holes for rain and one for a plunge pool should one be fitted later. The outside area comes with electric sockets and lights for both the courtyard and the roof terrace. Steps from the courtyard take you to a spacious tiled roof terrace solarium with views over the hills of the Alcornocales Natural Park. There is space for sunbeds and table and chairs and there are two washing lines. There are three double bedrooms upstairs, the large master bedroom has a Juliette balcony to the front of the property and there are two other bedrooms with twin beds to the rear. The house has low energy wall heaters in all rooms and an additional portable gas heater. There is satellite dish on the roof for the TV. The house has been rewired with a new meter outside and a new fuse box inside. This Jimean house would make an ideal holiday home and great investment property. It rents out to holiday makers at £300 – £350 per week and have approximately 3 – 4 months of bookings per year spread throughout April – October. The cost of maintenance of this property is also minimal. There are no community fees and the IBI ” council tax” is only 260 Euros per year approx. Other places where you can stay and eat include El Anon. This village house in Jimena must be viewed. For further details please click here. 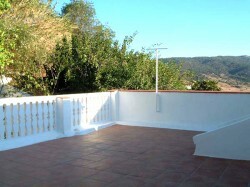 If you would like to see other properties for sale in the Jimena area- please click here. IBI: 260 Euros per year approx.